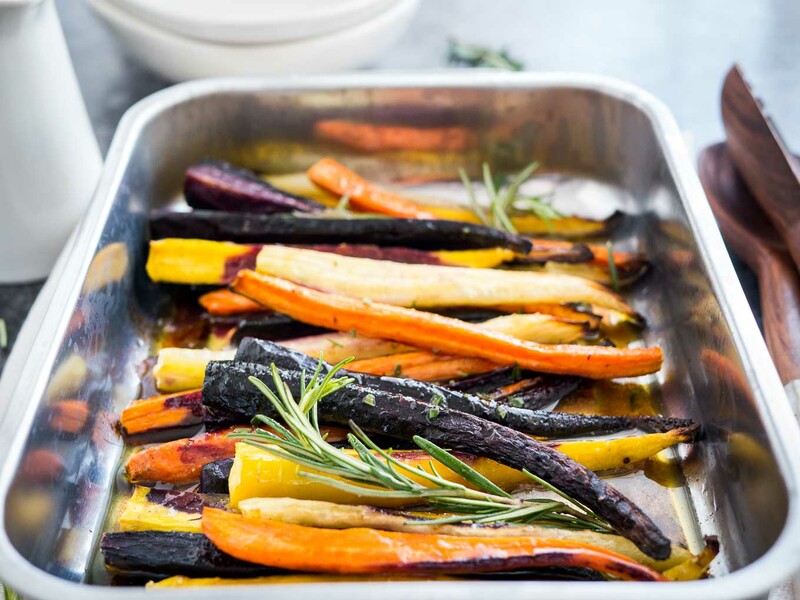 These Brown Butter Maple Glazed Roasted Rainbow Carrots are the easiest and most delicious side dish ever! Oven roasted carrots with a simple brown butter maple glaze. So easy to make yet elegant enough for special occasions like Easter or Thanksgiving! These are the BEST carrots ever and they’re so easy to make! 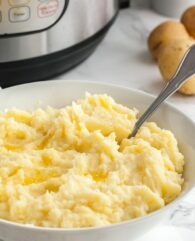 Like my Gorgonzola Potatoes au Gratin, my Creamy Crock Pot Mashed Potatoes, and my Crockpot Italian Sausage Apple Stuffing they make a great side dish for every special dinner! But these carrots are also weeknight meal approved because they only take a few minutes of hands-on work. 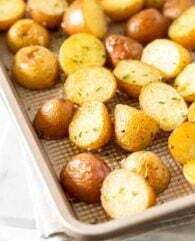 Roast them in the oven while you make the entree and you have a delicious meal that will have everyone begging for seconds! Roasting the carrots in the oven gives them a slightly caramelized flavor and the delicious glaze is so good I could eat it on its own. Butter is a great flavor component like it is but brown butter is even more delicious! 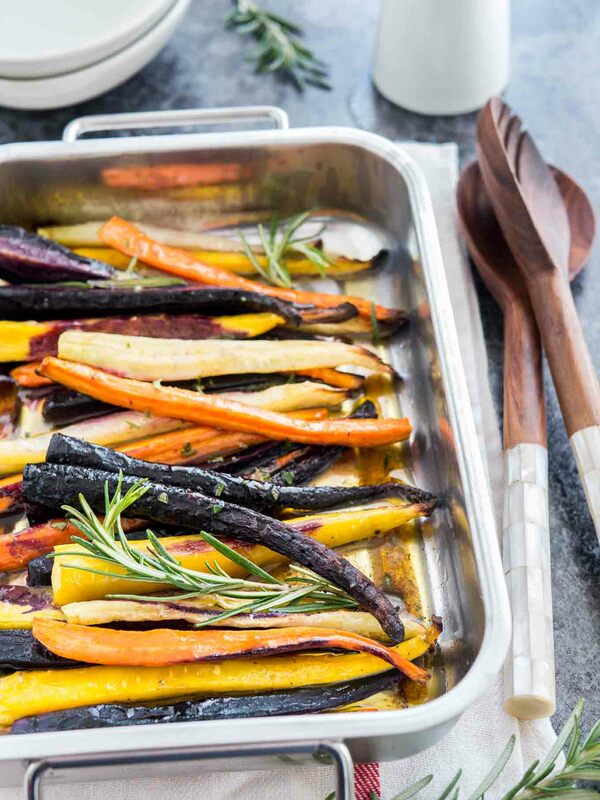 These Maple Roasted Carrots will surely become your family’s favorite side dish. I have to admit most of the time I’m a little bit too lazy to make a vegetable side dish for our weeknight dinners. I work from home and am usually in the kitchen for recipe testing, so when dinner time comes around I’m often struggling to be motivated enough to make an elaborate dinner. But these carrots are so easy to make that they’re one of my go-to veggie sides! Peeling and cutting them is done in less than 5 minutes and the glaze only takes me about 3 minutes to make from scratch with ingredients I always have in my pantry. 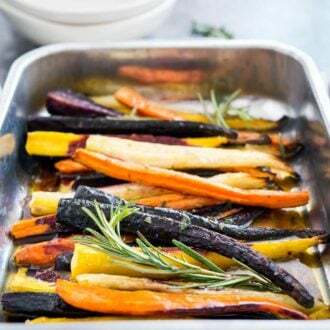 These roasted carrots with maple syrup and brown butter are a great side dish for a traditional roast or turkey on Thanksgiving but they also make a great addition to easy weeknight meals like pork chops or chicken. I used rainbow (or heirloom) carrots for this recipe but it’s totally fine to use normal carrots instead. The rainbow carrots look prettier but are also harder to find. You’ll also need fresh rosemary for this recipe, it works perfectly the maple syrup and brown butter and adds great flavor, don’t omit it.
) and trim the tops and bottoms off. My carrots were rather thick so I sliced mine lengthwise into quarters, depending on how thick the tops of your carrots are don’t slice them, cut them in half or quarters. They should all be of the same thickness to cook evenly. so you can see when the butter turns brown. I don’t have one (yet) so I always use a white spatula to see which color the butter has. When there are little brown bits on the bottom of the pan and the butter smells nutty it’s ready. Take the pan off the heat, add the other ingredients and drizzle the glaze over the carrots. Enjoy! 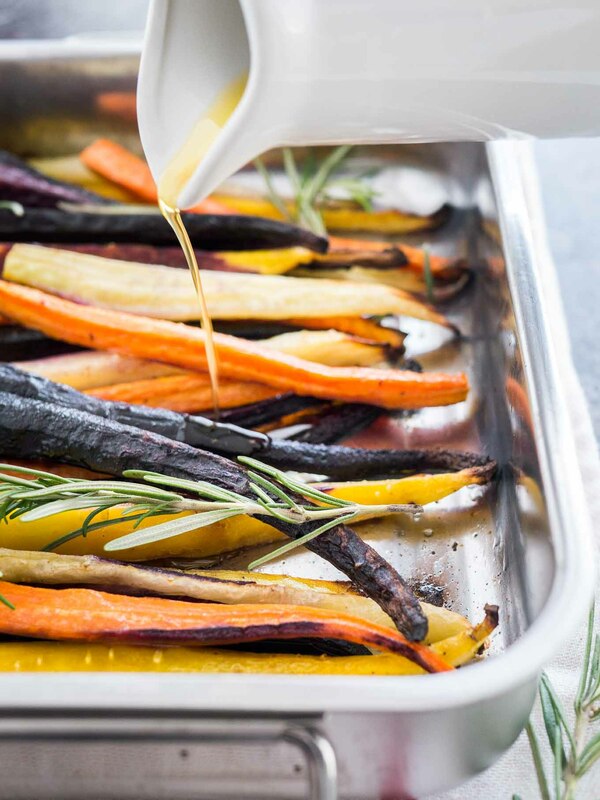 These Brown Butter Maple Glazed Roasted Rainbow Carrots are the easiest and most delicious side dish! Oven roasted carrots with a simple 3-minute glaze. So easy to make yet elegant enough for special occasions like Easter or Thanksgiving dinner! Peel and cut carrots in half, lengthwise. Depending on how wide the thicker ends are, you may need to slice each stick into quarters, lengthwise. 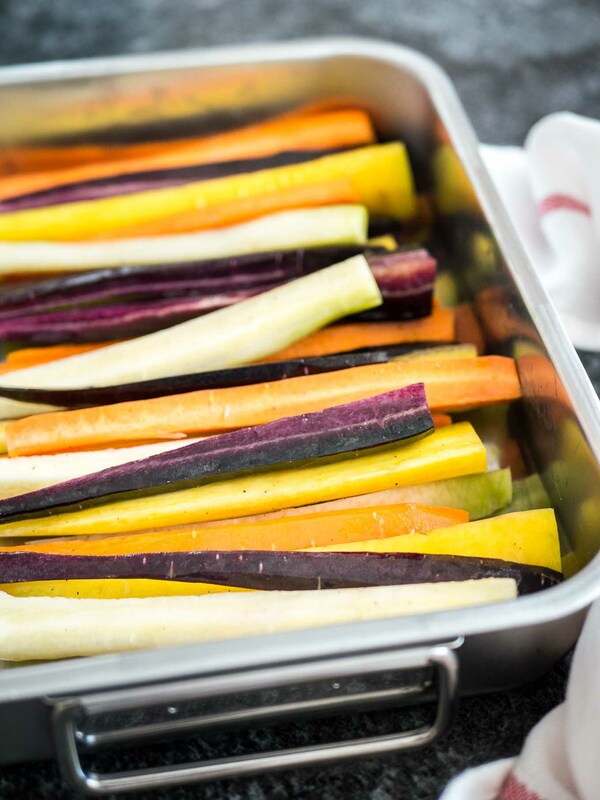 In a shallow baking dish, toss carrots with olive oil and season with salt and pepper. 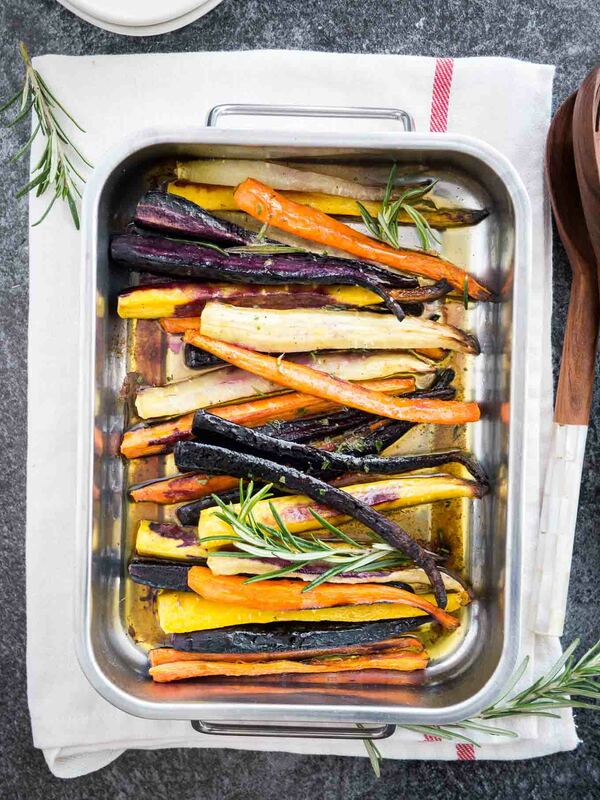 Roast in the oven for 30-35 minutes until carrots are tender. Melt the butter in a small saucepan over medium-low heat, once it starts to foam keep a close eye on the color. As soon as it turns a pale brown remove from the heat and add maple syrup and rosemary. 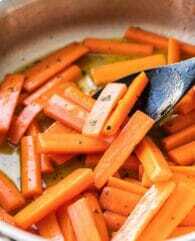 Drizzle glaze over carrots, shake pan to coat and serve. SOME MORE RECIPES YOU’LL ENJOY! I have a lot of recipes to choose from if you want to take a look at my recipe index, but here are a few of my recent recipes. This easy carrot cake is a simple but so delicious and moist sheet cake that is perfect for Spring and especially Easter! If you’re looking for a recipe to make with your new Instant Pot you need to try this Instant Pot Carrot Soup Recipe or my favorite Instant Pot Chili Recipe, both are perfect for Instant Pot beginners. These are seriously so delicious! Big hit with mom and sister! Working them into Thanksgiving menu! I’ve made these so many times they are my staple recipe when I need a veggie with dinner quickly!